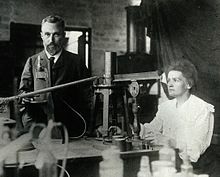 Maria Skłodowska-Curie (7 November 1867 – 4 July 1934) was a Polish-born scientist. The first woman to be awarded a Nobel Prize, in 1903, for Physics, she became the first person to win two with the 1911 Nobel Prize for Chemistry. She founded the Curie Institute. Variant: In science, we must be interested in things, not in persons. Variant translation: A scientist in his laboratory is not a mere technician: he is also a child confronting natural phenomena that impress him as though they were fairy tales. Humanity needs practical men, who get the most out of their work, and, without forgetting the general good, safeguard their own interests. But humanity also needs dreamers, for whom the disinterested development of an enterprise is so captivating that it becomes impossible for them to devote their care to their own material profit. Without doubt, these dreamers do not deserve wealth, because they do not desire it. Even so, a well-organized society should assure to such workers the efficient means of accomplishing their task, in a life freed from material care and freely consecrated to research. 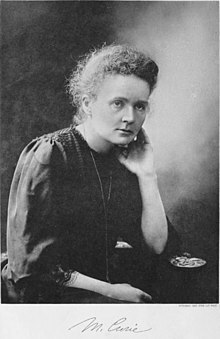 Marie Curie was at heart a Baconian, boiling tons of crude uranium ore to demolish the dogma of the indestructibility of atoms. by Ernest Rutherford (a 2nd edition was published in 1905). Mme Curie made a detailed examination by the electrical method of the great majority of known substances, including the very rare elements, to see if they possessed any activity. In cases when it was possible, several compounds of the elements were examined. With the exception of thorium and phosphorus, none of the other substances possessed an activity even of the order of 1/100 of uranium. It seemed probable that the large activity of some of these minerals, compared with uranium and thorium, was due to the presence of small quantities of some very active substance, which was different from the known bodies thorium and uranium. This supposition was completely verified by the work of M. and Mme Curie, who were able to separate from pitchblende by purely chemical methods two active bodies, one of which in the pure state is over a million times more active than the metal uranium. This important discovery was due entirely to the property of radio-activity possessed by the new bodies. The only guide in their separation was the activity of the products obtained. ...The activity of the specimens thus served as a basis of rough qualitative and quantitative analysis, analogous in some respects to the indication of the spectroscope. The chief difficulty lay in the fact that pitchblende is a very complex mineral and contains in varying quantities nearly all the known metals. ...The analysis of pitchblende by chemical methods, using the procedure sketched above, led to the discovery of two very active bodies, polonium and radium. The name polonium was given to the first substance discovered by Mme Curie in honor of the country of her birth. The name radium was a very happy inspiration of the discoverers, for this substance in the pure state possesses the property of radio-activity to an astonishing degree. This page was last edited on 15 April 2019, at 14:29.